Congratulations on your successful nesting season! Once the baby bluebirds have fledged they move around in a family group. At first they depend on the parents but soon catch on to picking out objects that might be food. This is the best time to watch them at the feeders. Birds only supplement 10 to 20 percent of their diet at feeders. Most birds prefer to forage for food and eventually the parents take the young farther and farther from the nest site. This family vacation or training period lasts for about 3 to 4 weeks. If there is enough time, and you clean your nest box out, they may come back for a second nesting. 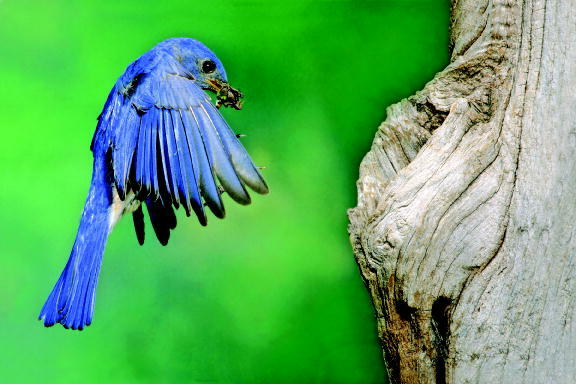 After nesting season has ended, Eastern Bluebirds usually form large nomadic groups that roost at night in the woods. This will help increase their survival through the winter. These late summer flocks change their diet from mainly insects over to more fruit, nuts, and berries. 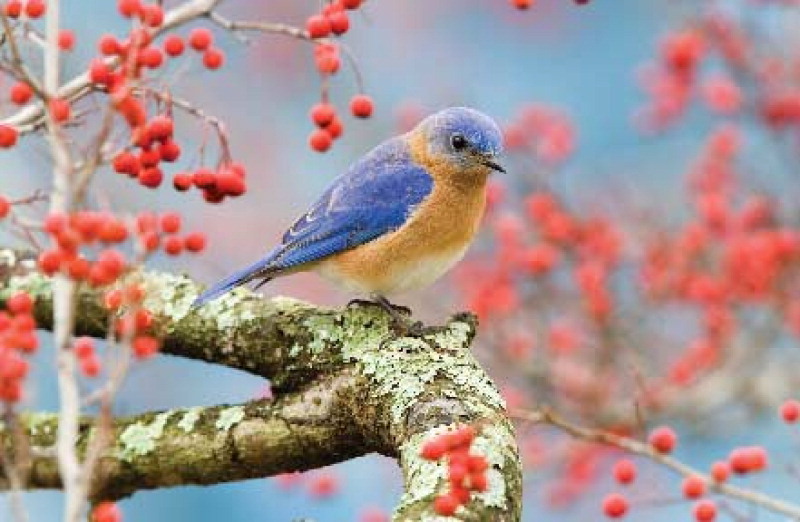 If you have fruit trees, a feeder or a reliable source of water, you may host the bluebirds year-round. 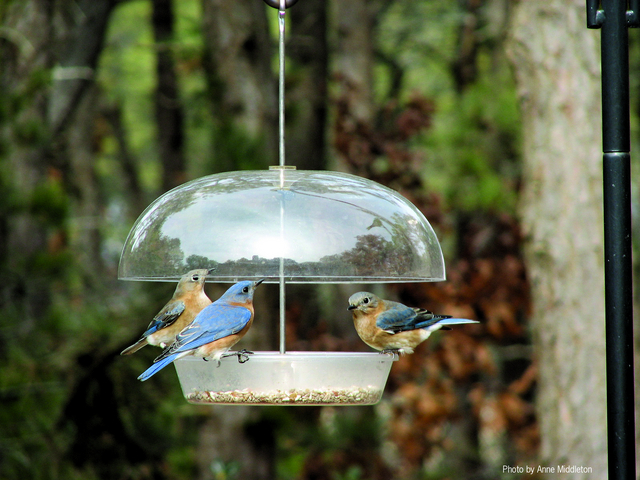 You can contact your local Wild Birds Unlimited for specific information about bluebirds in your area. As I wrote before, they are considered partial migrants. In mid-Michigan and many other states, many bluebirds are year-round residents or move further south if the weather becomes too harsh. Scientists think it’s due to genetics whether they want to fly south or winter over. Some birds are compelled to move south and others are not. It’s more important that you tell the new owner of your house to monitor your nest boxes next spring. 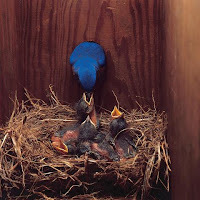 Bluebirds may raise 2-3 broods in one season. 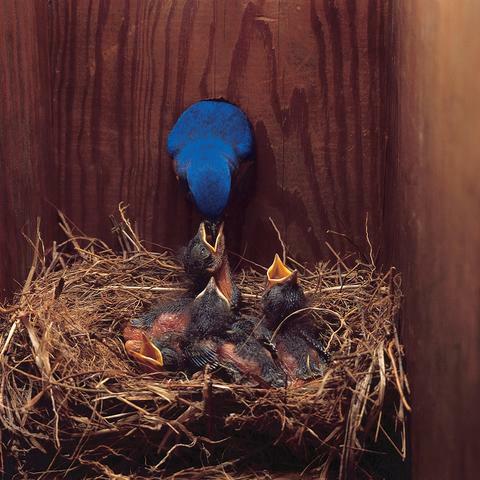 Some studies have shown that about 30% of adult bluebirds return to previous nesting sites the following season. 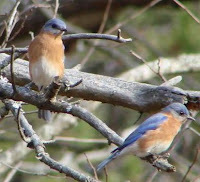 Eastern Bluebirds prefer to nest in cavity holes excavated by woodpeckers with a grassy clearing nearby for hunting bugs. You probably know from the late 1800s to the 1960s, Eastern Bluebirds’ population declined almost 90% in part because of loss of habitat. However, since 1966 the population has increased 2.4% each year due to nesting boxes, better landscaping, and bird feeding practices. 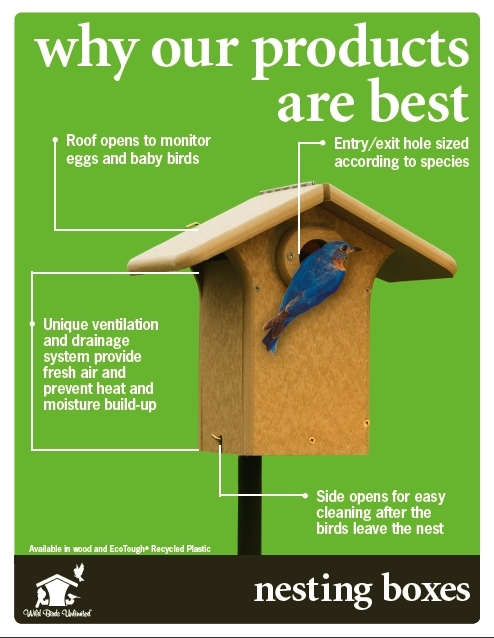 It is very important to be a good landlord and monitor nest boxes so you will be alerted to any problems. And the nests should also be cleaned out after each successful nesting. By monitoring and cleaning out a nest box, you help deter parasite infestation and a predator’s ability to disturb a nest that is built on top of old nests. Hopefully all nestbox owners across the country will help in the ongoing effort to promote and facilitate bluebird conservation. We have a lot of bluebirds here in Charlotte however this time of year it seems we are swarmed with Cardinals. Northern Cardinals are the most sought after birds by backyard bird feeding enthusiasts. I'm sure many people are very jealous. By late summer, nesting is over and Northern Cardinals relax their defense of their territory boundaries. The birds sing less and flocks of cardinals begin to form. The Cardinals in our area don’t migrate but can expand their range while foraging for food. Young cardinals don’t have a set territory and can move around together freely in search of food. Older cardinals can join these young flocks for a time but drop out once it leaves their normal range. These ever changing flocks can consist of about four to twenty birds depending on the area, time of year, weather, and available resources. Southern states will see larger flocks, of course, because the population is higher in the Southeast. Flock size increases in December and January when temperatures decline or there is snow on the ground. The larger numbers help each other find food sources and look out for predators. About 40% of adult cardinals die each year. Most die during the winter in February and March when food supplies are low. Death may not be due to starvation but a weakened immune system or being forced to search for food in more open areas where birds of prey and other predators can kill them. Cardinal populations with access to a feeding station may be in better condition and more likely to survive the winter than cardinals without access. The Northern Cardinal is often the first bird to visit a feeder in the morning and the last to stop by and grab a bite at night. The bright red plumage of the Northern Cardinals is a magnificent sight against the snowy backdrop in winter. I hope you continue to see large flock all through the non-breeding season.